UniVoIP is a cloud based Communications as a Service provider (CaaS) based in El Segundo California. The company, formed in 2005 developed their suite of applications and service called OfficeConnect to enable businesses of all sizes to move their PBX and unified communications requirements from expensive on premises equipment into the cloud. Cloud based CaaS solutions provide SMBs (small medium businesses) with economical and administrative benefits, often removing the management and maintenance burden altogether. Consequently, UniVoIP has focused on providing an economical and feature-rich cloud based service that provides for easy online administration and management. As a result, UniVoIP OfficeConnect service comes with fixed and customizable pricing plans and two feature set plans, the Business and Enterprise editions. The Business edition comes with unlimited outbound and inbound minutes for US calls and has an impressive feature list. OfficeConnect’s 110 standard features are available with the Business edition and they provide all the typical PBX voice features that SMBs require. Features such as auto-attendants, IVR, call transfers and find-me-follow-me features are all standard. In addition, OfficeConnect provides one US number per user for direct dialing and a personal voice mail account. Interestingly UniVoIP provide 3 times the number of SIP trunks (channels or call paths) as there are users (SIP trunk channels = 3 x No of users) this is should allow for sufficient depth for call queue even in the busiest of times. However, that also suggests that a T1 telecommunication link will be required which doesn’t come cheap. UniVoIP can provide that physical T1 link in selected areas in California but if you are anywhere else, you will need to speak to your local Telco Company to provide the T1 link. As we have seen the Business edition supports all the basic incoming call handling functions expected of any cloud based VoIP service. Furthermore, UniVoIP’s Office Connect Business edition also supports many other PBX features such as call queuing, call parking and call hold. In addition, there is support for groups, ACD and even hunt groups. However, UniVoIP places emphasis on their administrative control panel, which can be used to configure both user and system features and settings. These are great online features but don’t really differentiate UniVoIP for its competitors as most if not all of the competition has online administration and control. What does, however make UniVoIP solution stand out from the rest is it has real time monitoring of user extensions and even groups most of the competition do not support real-time monitoring and reporting, they can only provide historical reports. Another issue you need to be aware of is that unlike most of their competitor’s services. Is that the Business and its enhanced sibling service Enterprise are perhaps not so closely related, as the Business edition doesn’t appear to be directly upgradeable. For example, there is not an upgrade available for the contact center or unified communication modules where as there is with the Enterprise edition. Similarly, the Business edition has application integration for Salesforce.com and Microsoft Outlook available as an advanced feature at extra price but integration module for Gmail and Skype for Business are not available. However, the Gmail and Skype integration modules are available as extras for the Enterprise editions. Therefore, when initially selecting which path, Business or Enterprise, to select, a lot more planning and due diligence will be required to ensure you have future growth planed for. The Enterprise Edition is the flagship version of OfficeConnect and supports thirty or more features as standard, some with greater or lesser value than others. For example, the Enterprise edition has additional Group support such as group paging, both initiating and receiving pages. In addition, there is also group to presence detection, which allows Enterprise users to join or leave a group. However, probably more useful for most deployments would be the ACD support and the ability to hot desk, which is the feature that allows a user to move around the building and receive calls on any local extension simply by configuring his number onto the local handset or Softphone. On the face of it there doesn’t appear to be too much between the Business and Enterprise editions. However, you must remember some very important modules are only available to Enterprise users, such as the unified mobility module. The main functions of the Unified Communications module are provided through the UC Client. The UC Client provides support for presence, messaging, video conferencing and the integration with third party applications such as Outlook. There is also support for a web portal, which provides the functionality for contact management, dynamic presence status, as well as a means for web video conferencing. However, it also provides the mobile applications and soft phone to run OfficeConnect on Smartphones, tablets or PCs respectively. 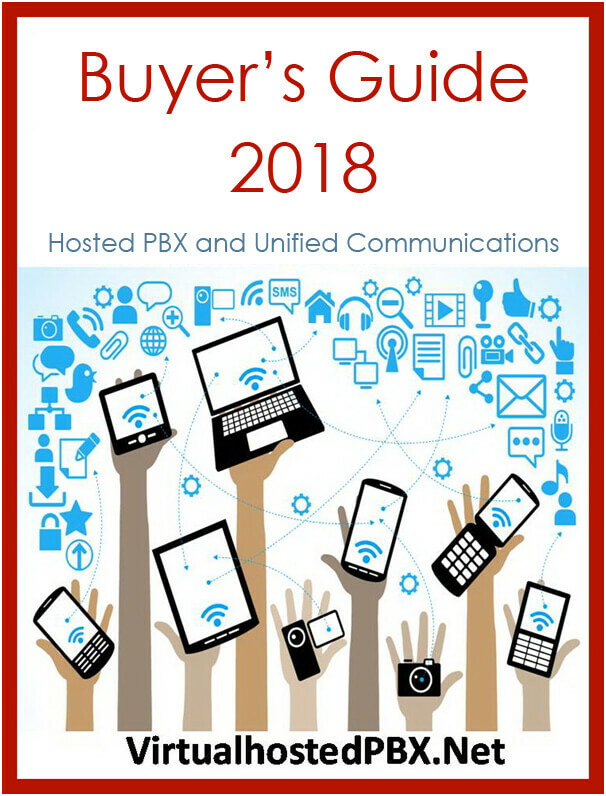 The importance of the Unified Communications module is it includes Softphone, and mobility support for smartphone, such as Apple, Android and Blackberry. What that means is only Enterprise users will be able – at an extra fee – to access these mobility features. This seems a strange policy as most of UniVoIPs competition provides mobile apps and mobility as standard features. However, to not have those features available to Business Edition users even at an additional price is baffling. UniVoIP also has a Contact Center support module, which supports all the basic features required for an SMB to operate a small call center. The main features are provided through three main components, a Contact Center Agent, a Contact Center Supervisor and an advanced IVR. The CC Agent is responsible for providing the unified desktop support than enable handling all types of media seamlessly. Additionally, the CC Agent also handles call routing and multimedia data streams as well as providing algorithms that enable skill based routing and other call-queue management techniques. The Contact Center Supervisor module provides the real time reporting and call management capabilities and tools. These tools are essential in a contact center environment as a supervisor must see the call queues and call history in real time in order to manage call distribution and to meet SLAs (service level agreements). In addition, there is the Advanced IVR, which is required to provide the caller with options from a menu and with advanced self-services tools. Again, these options are available as advanced features to Enterprise users but not to Business users. The pricing as we saw earlier is customizable, starting at $14.99 per user a month. However the custom plans come with no free minutes though for default plans such as Business ($19.95) and Enterprise (24.95) there is unlimited local calls both inbound and outbound. 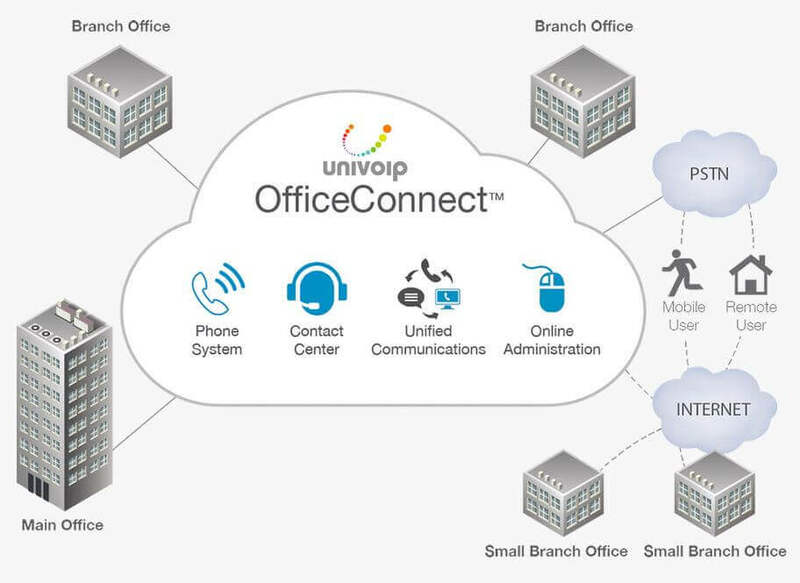 UniVoIP’s OfficeConnect has some very notable features, other than its PBX capabilities, for example it provides an SLA for service reliability and up time, one of the few companies in the industry that do this. UniVoIP are also very generous with their call paths for the SIP Trunks provisioning which determines the number of concurrent calls a system can support. However, these do require that you are located in certain areas that UniVoIP or its service partner can support and I suppose they can afford to be as you are paying for the T1 circuit. With regards features, prices and plans, UniVoIP is notable for some of the wrong reasons. It does provide a flexible and customizable solution with low rates per user per month ($14.95) however, that rate will be determined by quotation and so will probably require a multi-year contract for a minimum of users. However, the real problem when comparing OfficeConnect with for example RingCentral, is that UniVoIP have left many of the valued features such as smartphone apps and softphones an extras where as RingCentral and most others include these features as standard. Consequently, OfficeConnect’s price plans do not seem such good value when you consider all the extras you will need to purchase to have even the basic mobility and unified communication features that are standard user tools in today’s business. For further information about UniVoip click here.